Houses are essentially family-run concerns. Champions are traditionally drawn from the ranks of each house leader’s own kin. But Ian Merlin has chosen not to fight for his father’s house, to which he has renounced all connection. He will fight for a rival house, Prospero. It’s just one indication of how dysfunctional the families of the Unseen World have become. Grey Prospero would have been a poor choice to fight for House Prospero; a child of privilege, he has always been happy to settle for a gentleman’s C. Ejected from Prospero for a horrific crime, he still resents the loss of status that was his by birthright. The same crime that got him cast out promises him the power to take back what should be his. Or so Grey has convinced himself. Sydney, a tribute consigned to the House of Shadows, has a deeper grasp of the fundamentals of magic than her rivals. Knowledge is power; Sydney could easily win the Turning, and her freedom from Shadows. Sydney is playing a much deeper game than her own escape. She is determined to save every abandoned child from Shadows. To do that, Sydney is willing to pay any price, even kill her lover Ian if he has the bad luck to come up against her in the Turning. Most magicians try to forget that the fundamental fuel for magic is sacrifice. Sydney embraces that truth. This is the second Howard novel in which a series of tests serve an ominous purpose. Granted, two is a statistically invalid sample … but the coincidence makes me wonder about Howard’s educational background and whether writing is a valid way to get academic anxieties out of one’s system1. This book was a bit less focused than Roses and Rot. The quest of one supporting character (Harper Douglas) to find the person who murdered her best friend (Grey) ultimately dovetails with Sydney’s grander quest, but it may seem a distraction to some readers. Readers may see contemptible parasite Grey as a symptom of the Unseen World’s fundamental rot. The high and mighty made a decision, generations ago, to commit terrible crimes, demand ongoing sacrifices from other people, for personal convenience. Not that this is necessarily wrong — there’s no essential difference between powering a dishwasher with the heart of a forsaken child and brutally exploiting farmers to keep the price of chocolate low or poisoning entire watersheds to recover some shiny metal — but because the story is told from the point of view of Sydney, a victim who didn’t have the grace to die without complaint, the great and powerful come off rather poorly. Skillfully written and plotted, with engaging characters, Unkindness shows that Roses and Rot was no fluke. 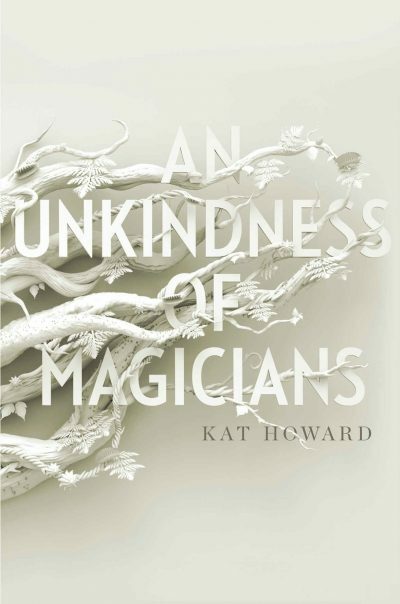 An Unkindness of Magicians is available here (Amazon) and here (Chapters-Indigo). 1: Younger readers may be interested to know that thirty-five years after leaving school, I still get exam nightmares. Not necessarily wrong - um... all right, probably a dozen times a day I consume the product of labour of people who don't get the chance to have it as good as I do, and then there's animal welfare to consider, which I can't really justify as "they live safe and well until they are suddenly killed and fed to me". One speech that I recently read goes, "What if, and I throw this out to you as a hypothetical, what if it was all right to feed on people? What is feeding on people anyway, but good old exploitation? And we're perfectly happy to exploit people, aren't we?" This is a recruitment pitch to a team of repentant vampires who were looking at other retirement options, and if it's a bit simplistic, in context it was backed up with a dose of hypnotism. I don't want to place it because it's rather a surprise scene in the story. Then there was the sympathetic working character and churchgoer in stories of Glasgow a hundred years ago - Erchie Macpherson - whose sympathy didn't run to regretting much that miserable deprivation in the city's slums was the flip-side of the provision of good shirts and other consumer goods sold cheaply. It's in the collection here: http://www.gutenberg.org/ebooks/47991 under "A Son of the City", in the common tongue. Just after speculation on the home life of Andrew Carnegie and his pretty little daughter, in just the same language.